L60 Basic - lawn mower r . . .
Ambrogio's L60 Basic features the patented lawn detection system. As a result, it does not need any perimeter wire, and its special sensors automatically detect when and where the lawn ends. The Ambrogio L60 Plus has a 7.5 Ah battery instead of a 5.0 Ah lithium-ion battery. This allows the L60 Plus to mow up to 400 m² and the normal L60 Basic only 200 m². Due to its sweet curved shape, one falls in love with the L60 immediately. The processing is very precise and high quality. Wind and weather can not harm the mowing robot. He can stand the entire mowing season outdoors. 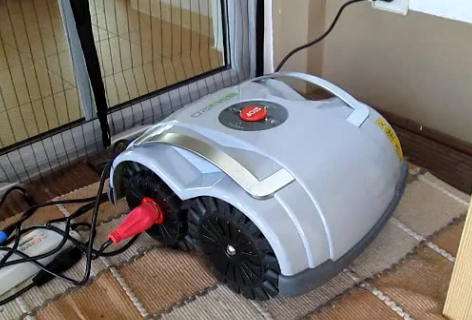 It has large stainless steel cutting blade that creates a fine and clean lawn section. The grass is cut so finely that it can remain as a fertilizer. This results in a perfect green and strong lawn. It works quickly and meticulously. Gradients of up to 45% are not a problem thanks to the All-terrain wheels. "Gradients of up to 45% are not a problem thanks to the All-Terrain Wheels.."
The Ambrogio L60 Basic does not have a charging station and is charged manually by the power supply. This makes it longer, but also has a long battery life. "Long running time for a perfect lawn." The L60 Basic has a very wide range of technical features. It mows on demand every day and conjures a perfect lawn in a very short time. "Detects the lawn area using sensors. Does not need a limiting wire!" The Ambrogio is about 60 dB, very pleasant and considerably quieter than a conventional petrol lawnmower. The neighborhood will love him and you. "Pleasantly quiet and barely heard a few meters away." You can test the Ambrogio L60 Basic for 14 days in your garden. We give 2 years warranty and free support on all our robots. If you have any questions or problems, please contact the Robotic Household Robotic Team personally, by phone or e-mail. "Do not know if your garden is suitable, then try the Automower for upto 14 days for free!" What if your Ambrogio L60 Basic is set to wire mode? If this is the case, malfunctions can occur during mowing. Therefore, use the following key combinations to return the lawnmower robot to the wireless mode. What are the LED indicators for the Ambrogio L60 Basic? The robot needs a limiting wire to detect the lawn. The lawn detection sensors are not active. When you finish this mode, read above. How do I charge the Ambrogio L60 Basic? Simply connect the red charging clamp to the left wheel and the black charging clamp to the right wheel (It is colour coded for ease). This will charge the L60 Basic. Attention: Picture shows the Wiper Blitz, this is an identical charging setup.